As a child, cauliflower was not a welcome guest on my dinner plate. The brown butter sauce my mom drizzled overtop was the single redeeming factor. Fortunately, cauliflower has come a long way from the mushy stovetop rendition many of us remember, proving itself to be as adaptable as it is healthy. Contemporary recipes have offered unique twists on favorite comfort foods such as mashed potatoes and pizza crust, all with the help of this versatile veggie. We’ve all heard the directive, reinforced by many popular diets, not to eat white foods like pasta, white bread, and sugar. 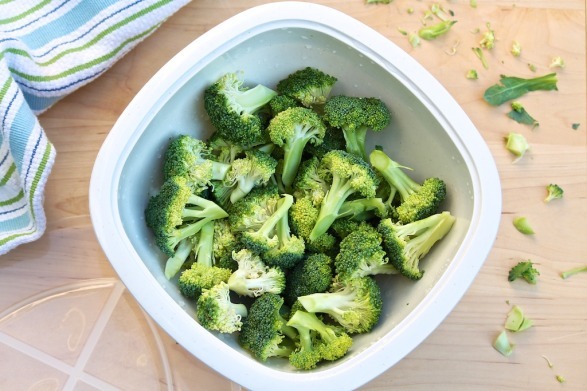 But this cream-colored cruciferous vegetable packs a nutritional punch. Loaded with potassium, vitamin C, and fiber, cauliflower also contains sulfur compounds that have been associated with a lower risk of some cancers. It happens to be low in calories and carbs, too. Several years ago, my friend, Justine, from Full Belly Sisters, sent me the following recipe with a note saying that she thought my family and the readers of The Fountain Avenue Kitchen would love it. She suggested getting over its “weirdness” and giving it a try. Knowing Justine’s knack for creating recipes that are as satisfying and delicious as they are healthy, I tried it right away. 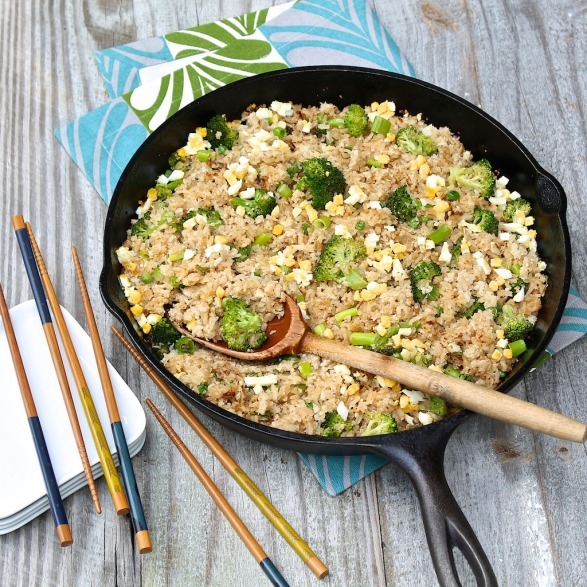 The brilliance of this fried rice dish is that half of the rice is replaced with cauliflower, thereby reducing the carb count while adding a variety of nutrients. Yet the method of preparation makes it look—and taste—a lot like rice. When I first prepared this dinner for my family, I didn’t mention the unconventional component. My intent was not to be sneaky; I just wanted unbiased feedback. They cleaned their plates, requested seconds, and my younger son actually asked for leftovers the following night. This recipe calls for a food processor to make quick work of mincing the cauliflower. In a pinch, this step could be done by hand. For best results, prepare the rice the day ahead; the texture of fried rice is better when starting with cold rice. If you happen to have leftover containers of plain take-out rice, by all means use them. The eggs and the remaining veggies may be prepped earlier in the day so that the dish comes together quickly and easily come dinnertime. If desired, sprinkle the finished dish with toasted sesame seeds. Or omit the eggs and top with chopped peanuts. Yields 4-6 main dish servings, more if serving as an hors d'oeuvre. Heat the olive oil in a large (12- to 14-inch diameter) skillet over medium heat. If available, a cast iron pan works well. Add the garlic and the white and light green scallion pieces. Sauté for one minute or until fragrant. Add the cauliflower to the skillet. Stir to coat with the oil, and then spread in an even layer and let sit; you want it to brown slightly to bring out the sweetness. After a couple of minutes, stir and spread out again. Add the cold rice and the coconut oil (or more olive oil). Raise the heat to medium-high. Toss everything together and, again, spread the mixture over the pan and gently press down. Let it sit for about two minutes so the rice toasts and gets a little crispy. Add the peas and broccoli and stir again. Drizzle the soy sauce and toasted sesame oil over the rice. Cook for another minute or so and turn off the heat. Add the chopped scallion tops and minced eggs. Toss and serve immediately. Leftovers are delicious, gently reheated, for lunch or dinner over the next several days. One of the ways I adapted the original recipe was by using hard-boiled eggs, which can easily be prepared in advance, in place of the stir-fried egg typical of fried rice. As an option, you may scramble two eggs, remove to a plate and roughly chop. Then simply wipe out the pan and proceed with the recipe, stirring in the eggs at the end. 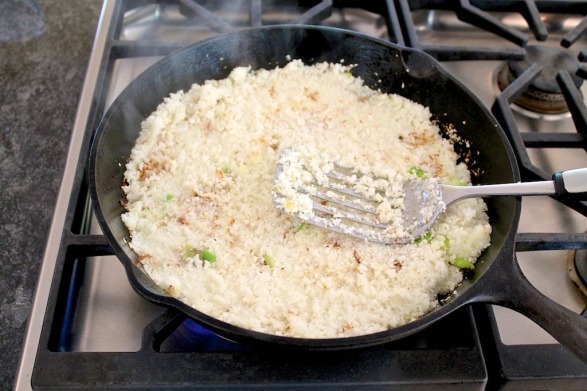 Pressing down on the cauliflower and letting it cook, undisturbed, allows is to brown a bit and develop great flavor. This was my absolute and total pleasure! As much as I love to make up my own recipes in the kitchen, it sure is fun to try the best of the best and encourage others to share their favorites! Don’t you just love getting good recipes from friends?? Thank you for sharing with me in the first place! This looks great! I would love to try it, but the husband isn’t a fan of cauliflower. Do you think I could pass it by unnoticed? There is a bit of a cauliflower taste, Debi, but no one in my family realized it was anything but rice until I told them. You could ease into it with half a head of cauliflower and a little more rice. Let me know if you try! Making this for dinner tonight w/ leftover roasted chicken. Anxious to try it. Going to try using scrambled egg in the dish since I’m anti-hard boiled eggs. I see scrambled eggs in the fried rice dishes in the restaurants, just not sure how to do it. Thanks for sharing this recipe! I hope you enjoyed the recipe! Scrambling the egg works very well in this recipe, too, and I hope it worked well for you. Thanks for you comment! I think this is the fourth time I have made this. My family and I love this dish. Thanks so much for such a good family friendly, veggie packed recipe! Thanks for the feedback, Johanna. I am so glad this recipe has been popular with your family. It has truly been a hit with everyone I have made it for, too! I loooovve this recipe. Oh my goodness. My kids gobbled it up and asked for leftover the next night. Need I say more? That is so great, Lily! My kids absolutely love this as much as my husband and I do. Thanks for the great comment! Thank you, Sonali. It’s definitely a bonus to get the thumbs up from a toddler!! 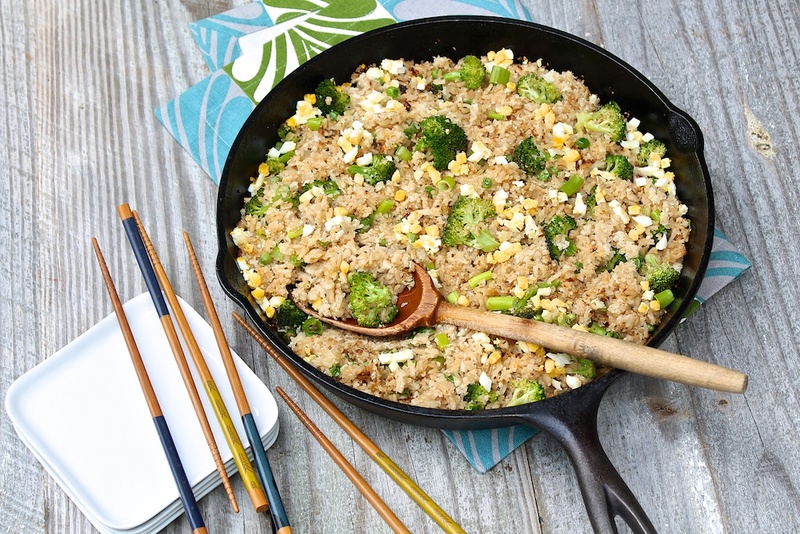 I was wondering if you could use all cauliflower and skip the brown rice? The flavor and texture will be slightly different–the rice adds a little more structure than the cauliflower–but you could absolutely make it this way, Debora. Let me know if you try!